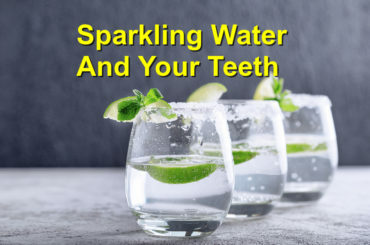 Dr. Scott's Dental Bytes: How Does Sparkling Water Affect Your Teeth? With the popularity of sparkling water on the rise, products like La Croix and San Pellegrino are being consumed more and more as people are shifting away from sugary sodas. Many patients and friends have expressed concerns over whether or not carbonated water is damaging their teeth. Here is the scoop! Sparkling water’s abscence of sugar is an added plus, however it is acidic. All acidity weakens teeth, but it is the amount of time in contact with the teeth, as well as the level of acidity, that determines how much damage can occur. Sparkling water gets its fizz from carbon dioxide, which in your mouth becomes carbonic acid, giving you that refreshing sensation. Although your teeth are in contact with the carbonic acid in these beverages, the level of acidity in most sparkling water is much less harmful than sodas and fruit juices. Unfortunately, many of these fizzy waters are flavored with citrus juices (sorry Pamplemousse fans), which can make them more harmful. As with most things we enjoy, moderation is the key. Consumption of fizzy water is safe for your teeth, especially those without added flavoring. Be mindful of what is in your sparkling water. Those with more citrus flavors or sugar added can increase the risk of damage to your enamel. Try to enjoy these drinks in one sitting or with meals to limit the exposure to your teeth. Also, rinsing out with plain water will help minimize the effects by neutralizing the oral environment.